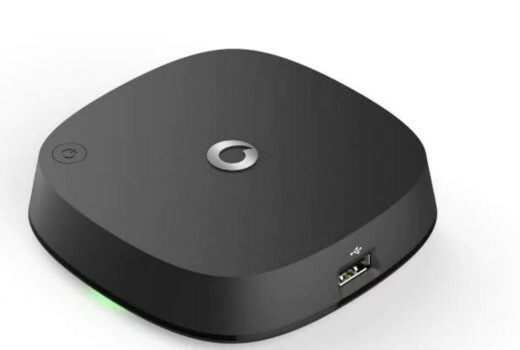 Vodafone is entering the Streaming device market with a new 4K hub that will compete with Telstra TV, Optus Fetch, Apple TV and Amazon’s Firestick. Retailing at $120, the Android device has access to Google Play and its apps, is compatible with free-to-air TV tuners and comes with a remote that features one-button access to Netflix and YouTube plus dual-band Wi-Fi. It is also available for $5 a month when signing to a 24 month NBN plans — Essential Plus and Premium — starting at $79 per month, both include 12 months of Netflix to boot. If you already have a Netflix account you will be provided with a code to receive the next 12 months of your standard subscription for free. Vodafone TV will also work on rival broadband connections so you don’t have to be a Vodafone broadband customer to use it. A key point of difference is a commitment to an open platform. “We’re not going to maintain the status quo by buying up content rights and building walls around it,” said Ben McIntosh, Vodafone’s Consumer Business Unit Director. “We don’t think it’s fair that Australians are being locked out of access to content they want to watch. Vodafone TV will be available in Vodafone stores from the middle of April. One would hope that it would run Android TV, and not Android. A very different proposition, as Android TV is designed to be used with a remote control interface, not a touch screen. Sadly there are many devices around that run Android instead. But yes, if it does run Android TV, then it’s an ideal device, as it will allow you to use whatever service you like (including Foxtel Now if you know what you’re doing), and also to use overseas services, because VPN apps are available directly from the Play Store. App makers need to make apps remote-friendly. But you can get around that with a bluetooth keyboard with a touchpad. Besides a BT keyboard is so much easier for typing than using the on screen keyboard. I’m well aware of the options regarding control. Most apps that one would use on such a device are already remote friendly (including some VPN apps). However if it runs Android rather than Android TV, then the device is as good as dead in the water, because the lack of convenience in the typical lounge room would be a deal breaker for most people. Given that it has a remote with Netflix/YouTube shortcuts, I suspect that it does in fact run on Android TV, and not Android like the wording implies. It sounds just like the Foxtel Now Box then, that too runs off Chromecast to open access to the Google Play Store (expect Netflix). So it’s almost as good as my MeCool KI Pro box, which has both DVB-T/T2 and DVB-S tuners, Android Nougat and cost US $77 incl. shipping. I’m curious to know who manufactures this device. This is actually quite a good deal.The 12 month Netflix subscription more than pays for the device alone.Unfortunately,i already have three streaming devices,so i don’t have a need for another one. So this device gives us access to FTA via aerial, existing streaming service apps, and additional content not available on Netflix, Stan, Amazon, etc..?